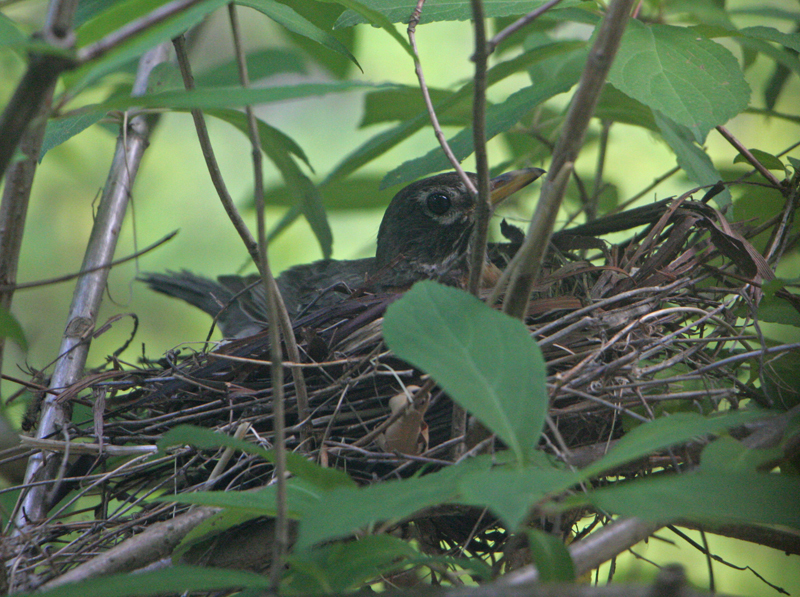 The American Robin is often the first bird a youngster can recognize. 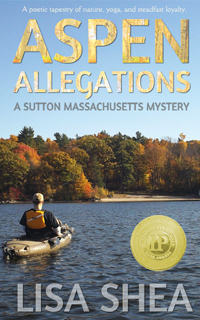 Instead of hiding in trees, it strides along lawns, hunting for worms. Its blue eggs are often used in nest illustrations. It has a warbling song it sings, when it is feeling musical. 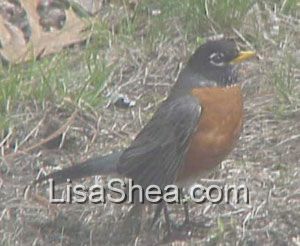 Robins do not live in Sutton year round. 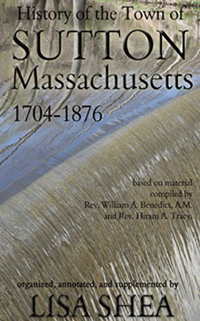 They arrive in spring after the snows melt, and then leave again in the fall. 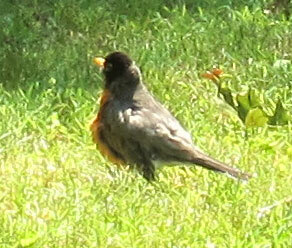 It's always fun watching for the first robins! 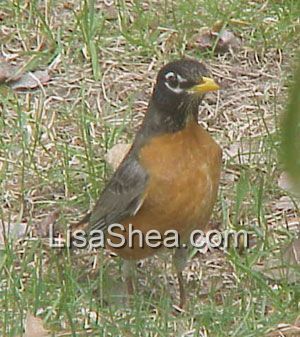 We often have two or three robins hopping around in our back yard, looking for insects and worms. This was taken in mid June, 2001. 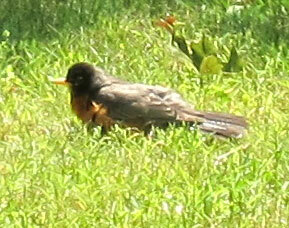 There were a pair of robins and it appeared it was a mother - child pair. They stayed near each other. When I stood up to get a better look, suddenly the mother started doing a "wounded bird" routine. 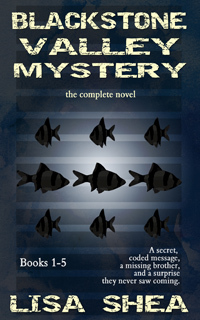 She began stretching her wings far out, then acting as if one was broken, then puffing up and so on. She was drawing my attention away from the child. As soon as I sat down, she went right back to normal! A few moments later she had found a worm, and slurped it down like a piece of spaghetti. On July 3, 2016, I realized a robin had built a nest in a shrub right by our front steps. I keep a tripod and camera in the window here to photograph the hummingbirds that come to the window feeder. She didn't mind the camera there at all. 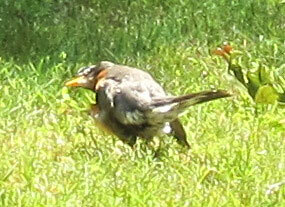 This bodes well for getting great photos of baby robins! 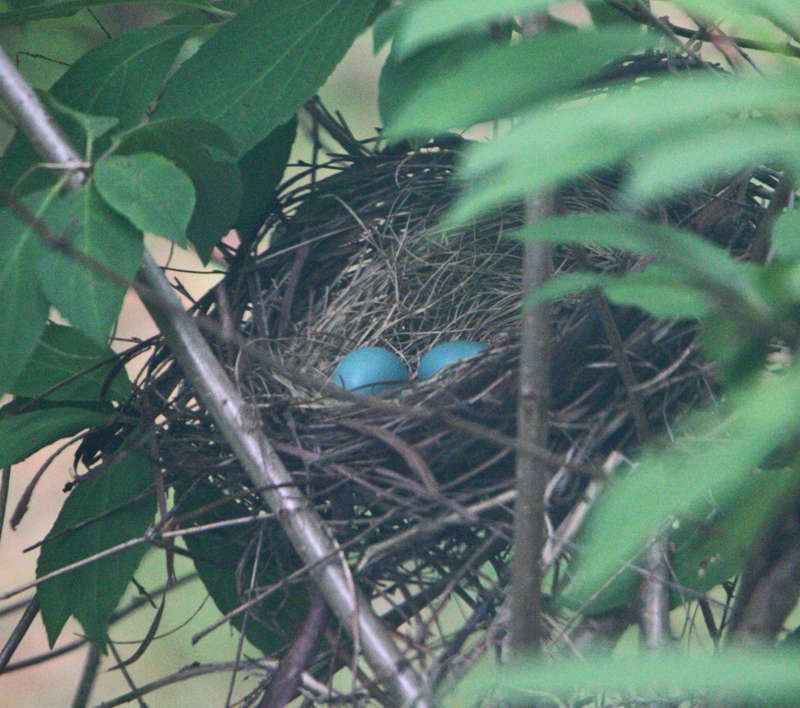 Here's the initial photos of the mother robin and her two sky-blue eggs. Or is that "robin's egg blue" :). I'll be posting more photos as the family grows!